This document is for accounting professionals who manage multiple clients. 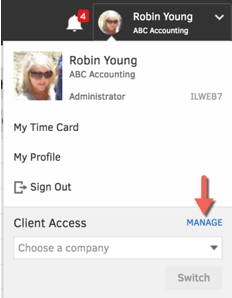 Working in Accountant view gives you full administrative access to your clients' TSheets accounts. Exception: You will have only view rights to Schedule. 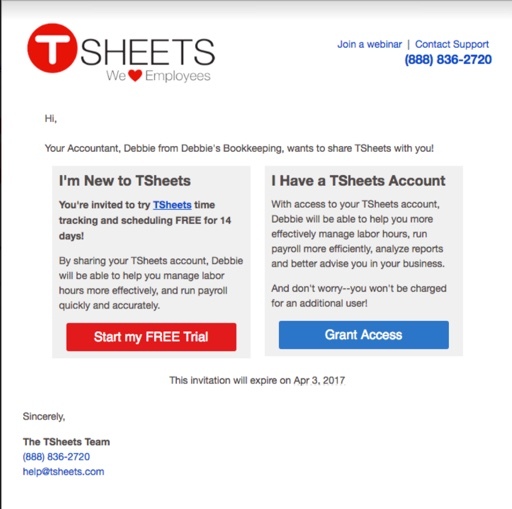 If your client is not currently using TSheets, and they set up an account via the email below, you receive a commission! When a client has accepted your access request, their status in the Manage Clients window will change to Active. Statuses are updated every five minutes. If it hasn't been that long, at the top right, click the X to close the window, and reopen it. 1. In TSheets, at the top right, click your name. 2. Next to Client Access, click MANAGE. 3. In the Manage Clients window, click Add Clients > Invite clients. The email invitation expires after two weeks. A new invitation can be sent anytime from the Client Access window. In TSheets, at the top right, click your name. Next to Client Access, click MANAGE. The Manage Clients window displays. Click Add Clients > Create client account. On the form, enter your client's basic information. To get back to your account, at the top, click Back to my account.